Some of you know, some don’t; for those who don’t, we created the Hart & Soul Coconut Lentil in collaboration with the very talented Melanie Lionello, @naturallynutritious about three years ago. We are very proud of it. It is so much more than a soup. You can use it in a lot of your own recipes as a base or to spice up your dishes! There is no doubt you will love the new recipe Melanie has created. A delicious Coconut Lentil Frittata. Like any good Australian, we love to get up on the week end and start the day with something delicious. Winter also calls for real food, something that nourishes you from the inside. We’re talking waffles, pancakes, porridge or FRITTATA! They are our favourite go-too’s. 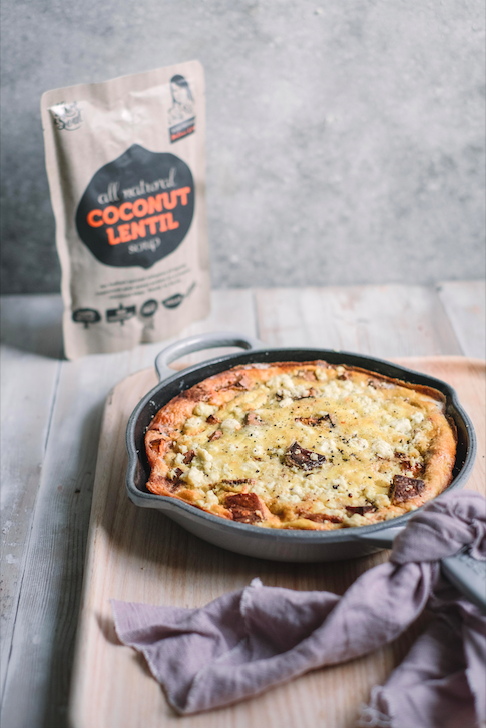 Easy breakfast food that only requires a cutting board, a knife, a mixing bowl and a skillet to prepare and how good does “Coconut Lentil Frittata sound? Little gem right?! Frittata is one of those meals that, if you know how to make are a kitchen standby. The eggs make it feel much more on the lighter side, which is always appreciated in the morning. We should also mention that this frittata is of course, gluten-free (unless you’re adding grains). Happy bellies! Use a non-stick pan so you don’t need to add any cooking oil or butter. If you don’t have one (like me), you can use a cast iron pan, but you will likely have to serve it from the pan. Ideally a frittata should be served on a plate. You’ll hold a plate over the pan and flip it upside down. Cook the Coconut Lentil frittata on medium-low heat; using a higher heat you will risk developing a not-so-nice egg crust on the bottom. The original Spanish frittata is eaten cold, several hours after they’re made. They’re perfect for brunch buffets because you can cut them and leave them on the table for people to leisurely serve themselves. Bake for 30-40 minutes, until golden on top. Serve right away while hot.